What is the YIELDDISC Function? The YIELDDISC function is categorized under Financial functionsFunctionsList of the most important Excel functions for financial analysts. This cheat sheet covers 100s of functions that are critical to know as an Excel analyst. It will calculate the annual yield for a discounted security. As a financial analystFinancial Analyst Job DescriptionSee a real Financial Analyst Job Description including all the skills, experience, and education required to be the successful candidate for the job. Perform financial forecasting, reporting, and operational metrics tracking, analyze financial data, create financial models, we often calculate yield on a bond to determine the income that would be generated in a year. Yield is different from the rate of return as the latter is the gain already earned while yield is the prospective return. The YIELDDISC function is not the same as the YIELD function as it calculates the yield on a discounted security. Settlement (required argument) – It is the settlement date of the security. It is a date after the security is traded to the buyer that is after the issue date. Maturity (required argument) – It is the maturity date of the security or the date when it expires. Pr (required argument) – It is the price of security per $100 face value. Redemption (required argument) – It is the redemption value per $100 face value. 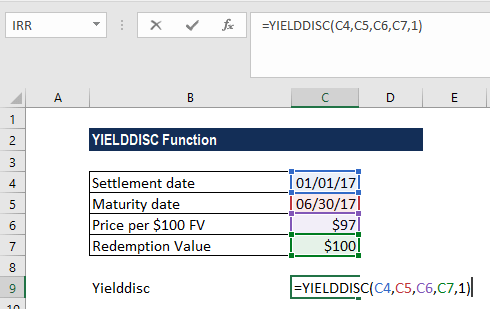 How to use the YIELDDISC Function in Excel? 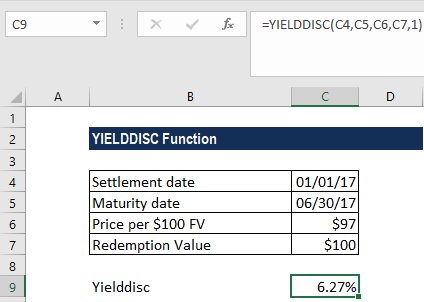 The above YIELDDISC function calculates the yield on the discounted security as 6.27%. We used as a basis the actual/actual basis. As recommended by Microsoft, the date arguments were entered as references to cells containing dates. The settlement date provided is greater than or equal to the maturity date. We provided invalid numbers for the rate, pr, redemption, frequency or [basis] arguments. That is, we provided rate < 0; pr ≤ 0; redemption ≤ 0; or [basis] is any number other than 0, 1, 2, 3 or 4. The settlement & maturity dates provided are not valid dates. The result from the Excel RATE function appears to be the value 0 or appears as a percentage but shows no decimal places. The problem is often due to the formatting of the cell containing the function. If this is the case, fix the problem by formatting the cell to show a percentage with decimal places. The settlement date is the date a buyer purchases a coupon, such as a bond. The maturity date is the date when a coupon expires. For example, suppose a 30-year bond is issued on January 1, 2012, and is purchased by a buyer six months later. The issue date would be January 1, 2012, the settlement date would be July 1, 2012, and the maturity date would be January 1, 2042, which is 30 years after the January 1, 2012 issue date.